Lebogang is a Chartered Accountant, having attained the designation after successfully passing the qualifying exams and completing her articles at KPMG. She is an experienced IFRS specialist with a demonstrated historyof working in various industries, both locally and internationally. 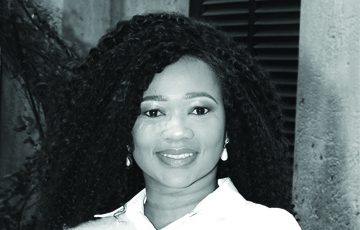 She is a Technical Director at the Pan African Federation of Accountants - a role that allows her to contribute to the growth of the accounting profession and the promotion of good governance practices across the African continent. Her passion for education and the development of aspiring Chartered Accountants is the driver of her involvement in the AWCA where she leads the secretariat function as well as the professional development sub- committee responsible for nurturing trainee accountants. Among some of the initiatives undertaken in this portfolio, are the Initial Test of Competence (ITC) and Assessment of Professional Competence (APC) Preparatory Workshops as well as financial literacy workshops. Lebogang continues to serve on the South African Institute of Chartered Accountant’s (SAICA) Initial Professional Development (IPD) Committee, which bears the overall responsibility for all aspects related to the qualification process towards the Chartered Accountant and Associate General Accountant designations. She holds a Masters of Business Administration qualification from the Gordon Institute of Business Sciences (GIBs).